Easy to use job description samples. Each job description clearly lays out the general purpose of the position, the tasks and responsibilities of the job, educational and knowledge requirements and the competencies necessary for successful job performance. Select the job description you need from the sample accounting and finance job descriptions, administrative and management job descriptions, the sales and marketing job descriptions, teaching, medical and hospitality job descriptions. expert input - utilize subject matter experts to gain an understanding of the job. These may include managers, supervisors and consultants. 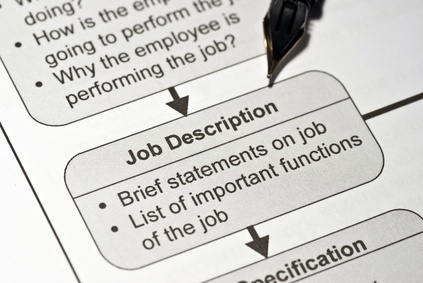 The job description is a key document for guiding the employee selection and interview process. Without a proper job description it is difficult to determine what you are looking for in a candidate, to describe the job to potential candidates and to evaluate the suitability of job candidates. For job candidates a comprehensive job description enables thorough preparation for the job interview and an excellent reference point for writing a relevant resume and cover letter.